About 100 members of the Russian Academy of Sciences, Academy of Medical Sciences and the CIS states, more than 150 State Prize winners, 2 Nobel Prize winners studied and worked at TSU. 10 museums: Museum of the History of Tomsk State University familiarizes its visitors with the main stages in the University's history; Museum of Archeology and Ethnography demonstrates all aspects of the life of “Tomskovites” for over 140,000 years; Museum of Zoology contains exhibits of 588 bird species including 60% of those entered in the Red Book, more than 150 species of mammals, and a great number of invertebrate animals; Museum of Mineralogy collection includes over 50,000 samples; Museum of Paleontology holdings consist of 7 training and over 100 research collections totalling 2 million catalogued items; Museum of the History of Physics contains over a thousand devices, a very rich archive, and thousands of photos; the Herbarium is rated third in Russia and the first in Siberia, and includes 500,000 plants and 12 thematic research divisions. The Siberian Botanical Garden occupies 128 hectares and houses a greenhouse complex and an experimental farm. A live plants exposition consists of more than 6,000 species. The staff of Siberian Botanical Garden was awarded the RF Government Prize in the Field of Science and Technology for the establishment of a botanical complex, unique for the northern latitudes of the planet. 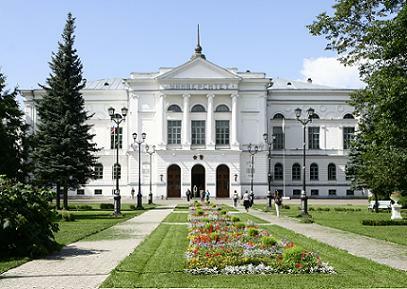 TSU's Research Library is the largest in Western Siberia and one of the largest nationally recognized libraries in Russia. Cultural Centre: 4 theatres, a jazz-band, an academic choir, a chamber symphony orchestra, a violin ensemble. Sport Centre: a swimming pool, a playing hall, a fitness room. ... cafeterias, snack and coffee machines, bicycle parking, copy shops, ATMs and MUCH MORE!